“Not in my house” gains a whole new meaning in the latest EuroLeague campaign. Euroleague Basketball has always stood for integration and against any kind of discrimination and violence, believing in sport and in basketball as a great tool to unite people regardless of their gender, age, sexual orientation, race or religion. Jaycee Carroll (Real Madrid), Nick Calathes (Panathinaikos OPAP Athens), Charles Jenkins (Khimki Moscow Region), Nemanja Nedovic (AX Armani Exchange Milan), Vassilis Spanoulis (Olympiacos Piraeus) form a starting five that, coached by Zeljko Obradovic (Fenerbahce Istanbul), represents and gives a voice to all players and coaches in the EuroLeague to embrace diversity and respect, both on and off the playing court. The campaign is powered by Euroleague Basketball’s community programme One Team, that uses the power of basketball to integrate communities. The programme, which has Turkish Airlines as its founding patron and Special Olympics as its proud partner, unites all 40 EuroLeague and EuroCup clubs in a coordinated effort to improve the lives of individuals in risk of exclusion within their communities by teaching them life skills through the sport of basketball that can have a real impact on succeeding in their effort to integrate themselves in the society. The One Team programme currently operates in 16 countries with 106 community partners, has had over 16,000 participants in recent years, and its message is supported by 169 ambassadors, including many Turkish Airlines EuroLeague and 7DAYS EuroCup players. 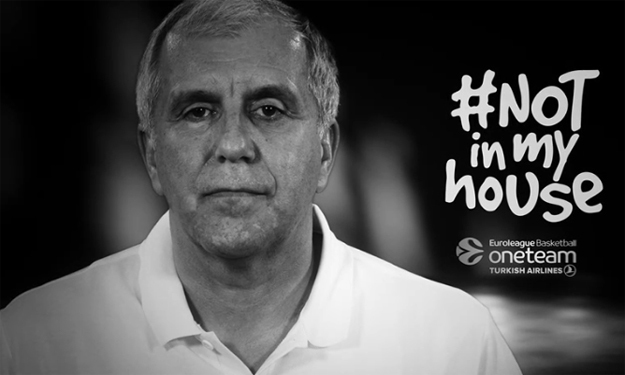 The #NotInMyHouse campaign invites all fans to join Euroleague Basketball, its clubs, its players, its coaches and its officials in the mission of acting as a powerful speaker to battle any kind of violence and discrimination in the sports arenas and beyond.